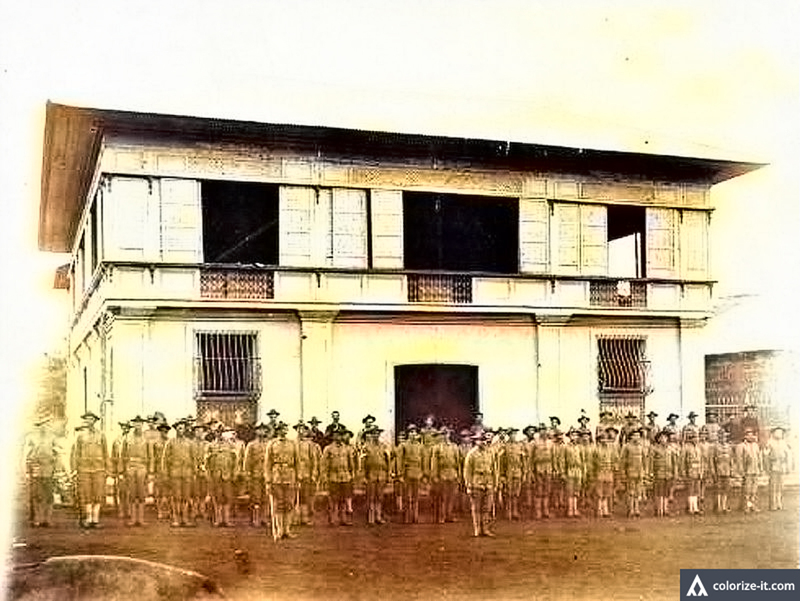 American troops during inspection in Batangas Town. Image source: Sandra Plummer Collection of the Fort Worth Library Digital Collection. Colorized courtesy of Algorithmia. We continue with the series on the operations of the United States Army in Batangas from 1901 to 1902, during the Philippine-American War. The information continued in this article is taken from an annual report of the United States War Department1. Brief details are presented in snippets arranged in chronological order, as they similarly appear in the original War Department document. For the benefit of readers who might have missed the first two installments of the series, these are archived under the Fil-Am War section of the main menu at the top of this page. On Mount Makiling in Cuenca, Batangas, an American group led by 1st Lieutenant Samuel R. Gleaves surprised a group of Filipino rebels including Comandante Igralisce Maloles, Captain Santiago Malijan and three other individuals. Captured with them were 5 rifles and some papers. With Gleaves were 2nd Lieutenant Walter Harvey of the 16th Infantry, 2nd Lieutenant Christian Bach of the 20th Infantry, and detachments of cavalry, infantry and Macabebe Scouts. In Taysan, 1st Lieutenant James D. Tilford of the 1st Cavalry, accompanied by detachments from Troops D and I, struck a band of Filipino rebels led by Captain Biristo Castillo. One of the Filipinos was mortally wounded and two others captured. Rebel barracks and a storehouse containing 8,000 pounds of rice, 31 uniform coats and 30 numbered blankets were destroyed. Local police and scouts were attacked by a band of some 30 ladrones (bandits) at a village called Sabang near the town of Nasugbu. The bandits or tulisanes were led by one Silvester Bebing. One scout and two policemen were killed while the others managed to escape. The bandits confiscated 2 Krag rifles, 2 shotguns and 200 rounds of ammunition, which would be a source of concern for the Americans. An American detachment led by 1st Lieutenant Patrick A. Connolly of the 21st Infantry, scouting west of Mt. Makulot and Buquil, Batangas found and destroyed two rebel cuartels (barracks) then fired on the retreating band of rebels. A detachment from Bauan, led by Captain John D. L. Hartman of the 1st Cavalry engaged a large group of some 400 Filipino rebels, half of whom were armed with rifles. The encounter was at the Bauan-Taal road, where the Filipinos had taken position and constructed rifle pits2. Despite being Ambush, Hartman and company managed to strike the rebels at their flank. In all, 25 rebels were killed, many more wounded, 2 captured and taken were 9 guns and 11 bolos. The Filipinos ultimately ended up being routed and scattering in all directions. Cavalry from Batangas Town and Bauan were sent to scamper after them in pursuit. Of the Americans, Corporal William McNabney and Private William I. Rudd were wounded. A detachment of some 30 men of the 21st Infantry, led by Captain Herman Hall and accompanied by a Dr. Lowe, after two days of scouting in and about the mountainous area south of San Juan de Bocboc destroyed a Filipino rebel camp under the command of a Tomas Ruidas. The camp had 10 buildings and 50,000 pounds of rice. The group had two engagements with a rebel band numbering 30, whose “guns were silenced.” The terrain in San Juan was described as “very rough.” One rebel who surrendered to the Americans pointed the latter in the direction of the camp. One Filipino rebel named Captain Felipe Morales was killed in the barrio of Antipolo in Lipa while attempting to steal cattle. He was killed by Filipinos who were friendly to the United States. A detachment of the 20th Infantry led by 2nd Lieutenant James V. Guthrie came upon a small group of Filipino rebels while scouting the mountains of Lobo. The rebels were scattered and eluded pursuit, but found and destroyed a large amount of rice that they left behind. In Nasugbu, a detachment of Company H of the 4th Infantry encountered a group of some 200 ladrones led by Comandante Siriaco Arraro. Eight of the bandits were killed while three were wounded and captured. On the American side, 1st Lieutenant Louis J. van Schaik was severely wounded by a bolo attack. Two carabaos earlier reported as stolen in Nasugbu were recovered after soldiers of Company B of the 4th Infantry, assisted by the local police of Indang, encountered a band of ladrones two miles south of the town. A Filipino employee of the United States Army quartermaster3 named Albero (Alberto?) was murdered on the street in Tanauan, Batangas, in full view of 13 houses. The reason for the murder was because he did not contribute his pay to the rebel movement and that he would not stop being friendly to the Americans. In retaliation, Captain John E. Morrison of the 20th Infantry warned the inhabitants of those houses that these would be burned if they did not furnish him with information about who murdered Albero. No information being given, he ordered the burning of the houses. A detachment of the 24th Infantry led by a Major Daniel Cornman returned from scouting the area of Mt. Maquiling near Santo Tomas, Batangas, where it captured 4 Filipino rebels and destroyed their barracks, where dynamite and explosive powder were also stored. In the mountains near Lipa (presumably Malepunyo), a group of soldiers from the 8th Infantry under the command of 1st Lieutenant Edgar T. Collins struck a group of some 60 Filipino insurgents, burning 14 cuartels and capturing 2 of the rebels along with 2 Mausers and 1 Remington rifle. 1 “Annual Reports of the War Department for the Fiscal Year Ended June 30, 1902,” report of the Lieutenant-General Commanding the Army and Department Commanders, published 1902 in the United States, online at HathiTrust. 3 The quartermaster was an officer in charge of logistics or supplies.